Should A Man Do Housework ? 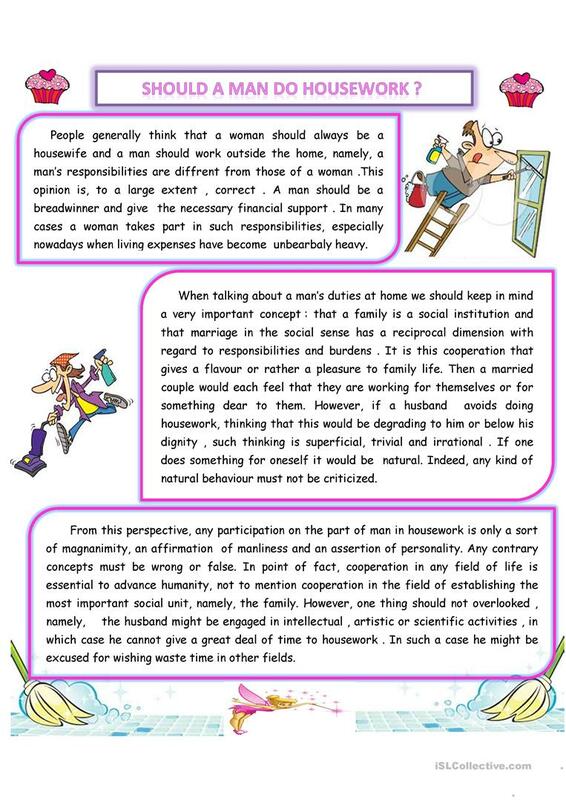 text about if men should do housework . The above printable, downloadable handout is best suited for adults at Intermediate (B1) level. It is valuable for consolidating SHOULD, SHOULDN'T in English, and is excellent for improving your students' Reading skills. It is about the vocabulary topic of Debate. meriemalg is from/lives in Algeria and has been a member of iSLCollective since 2014-02-16 19:34:26. meriemalg last logged in on 2014-12-07 07:45:56, and has shared 3 resources on iSLCollective so far.